The DIY community does not have many choices when it comes to reverbs. Basically the only option is to use the Belton BTDR IC. Which is not necessarily a big problem, as the mentioned IC has quite good sound qualities, so its success is not a miracle. 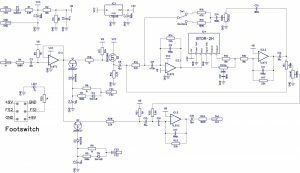 Most of the builders use the basic circuit provided by Belton with some minor tweaks (we had one of these in the blog too: Rub-A-Dub reverb), but there are a few who think a bit further and add some interesting features. In this entry our subject is Deadastronaut’s Chasm Reverb, which is exactly such an effect. It is worth to check out Deadastronaout’s website, he has quite a few interesting projects available there. All of them show a fresh and interesting approach. 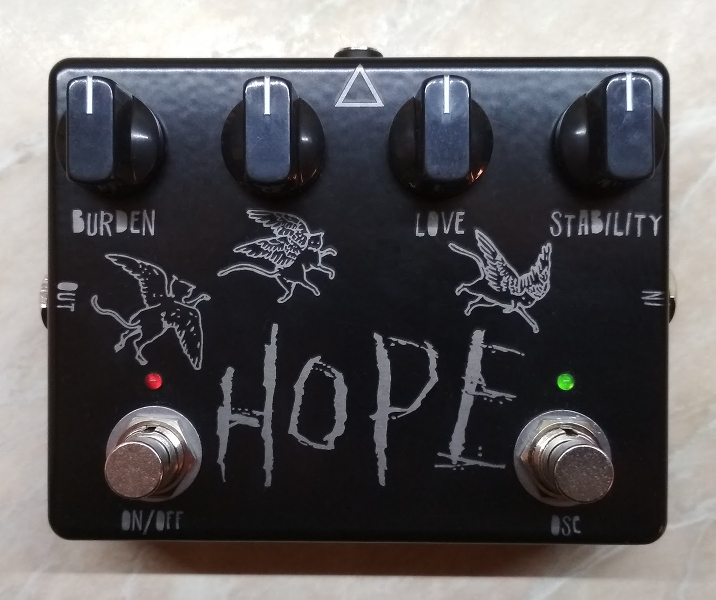 I have built one of his fuzzes and his tremolo, both are good sounding no-nonsense pedals. I hope to write about those too sometime in the future. His PCBs are available for a reasonable price and for all his projects he provides a full documentation should you want to start from scratch. I think what he does is a very good role model in the DIY community. But let’s get back to the Chasm Reverb. Over the standard Mix pot we have four more controls: the Level pot is self explanatory, the Damp pot can dampen the reverberated signal a bit, the Decay pot controls the feedback of the wet signal and can achieve a longer lasting and fuller reverb sound. The Oscillate switch controls the feedback too: engaging it the level of feedback gets so high that the effect starts to oscillate – you can achieve interesting noises with this option. The pedal is one of the rare non true bypass effects. The reason is that only this way could the “tails” feature be realized. “Tails” means that the wet signal still decays once you disengage the pedal. Of course if you don’t need this feature the effect can be built as a standard true bypass pedal too with some additional tinkering. The sound is basically determined by the BTDR IC, but since that is quite a good sounding unit we don’t have to complain about anything. The additional features designed by Deadastronaut make this effect an outstanding DIY reverb project worth to try out anytime. After the input buffer the sound gets separated for the switching. The switching is made with two JFETs. The schematic calls for 2N5457, but since JFETs in general are a bit obsolete it is good news that you can actually use almost any JFET types here, you only need to watch out for the eventual pinout differences. I have used J202 with success. After the switching there is another buffer, this time with a MOSFET. After this buffer we separate the signal to dry and wet. Dry goes directly to the Mix pot, wet goes through the reverb circuit. There is a feedback loop that brings a part of the wet signal (the amount is defined by the Decay pot) back again to the input of the reverb circuit. Finally there is an output amp stage. 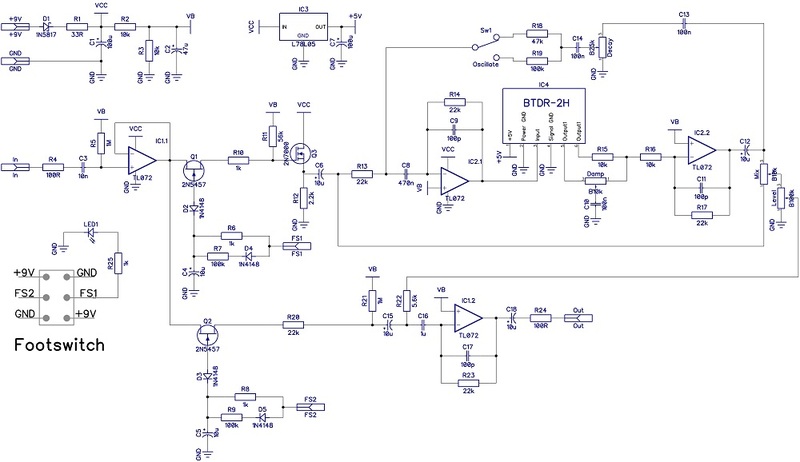 To make the effect true bypass one can leave off the two JFETs and the parts on their gates and simply connect the sources and drains of each JFET. Then the usual 3PDT solution can be used to wire the effect true bypass. I haven’t made any modifications to the original circuit, only used a footswitch for the Oscillate function. The build docu can be found under the Projects menu.